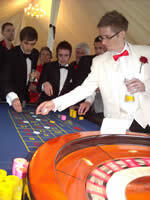 Vegas Nights - Creating Casino nights for event organisers for over 10 years. e provide mobile casino entertainment including hire of blackjack, roulette and poker tables. By providing croupiers, casino managers and all equipment we have enabled thousands of people to experience the exciting atmosphere of the real thing - without taking any of the risks! Our roulette, blackjack and poker tables are full-sized and all the equipment is just as you would find in Mayfair casinos. Our croupiers are trained professionals, specially selected not just for their expertise and appearance but also for their ability to put people at their ease. They will encourage your guests to get started. We also provide cards which explain how to play. for the cost of the prizes whilst retaining the exciting and unknown elements of the casino. Everyone has the chance to win a prize and you don't have to favour one guest over another. Success is down to their skill - and Lady Luck! Fun Casinos for charity fund-raising work in exactly the same way, except guests pay a nominal sum for each chip and that money goes straight to the charity of your choice. aturally, all our events are run strictly within the law. Your event will not need any special licence. ensuring the professional service we promise to provide. We are one of the original mobile fun casino companies established in 1990. Many others have tried and failed to reach our high standards. We continue to offer the most comprehensive value for money package available. a service they can trust, a service that goes beyond the basic entertainment requirements.